Stats: 72 metres, Tankoa Yachts, 2018, 12 guests, 18 crew Highlights: Designed by Francesco Paszkowski and Margherita Casprini, the recently delivered Solo is one of the swankiest superyachts cruising the Med this summer. Among her highlights, there's a glass fronted infinity pool that sits on the main deck, a Jacuzzi with a swim up bar, and a helipad that doubles as a dancefloor. For those in need of some R&R, Solo’s beach club has a sauna, hammam and massage room, and for those who enjoy a faster pace, she is stocked with watersport equipment including scuba gear, Jetskis, Jetsurfs, trampolines, kayaks and a sea pool. 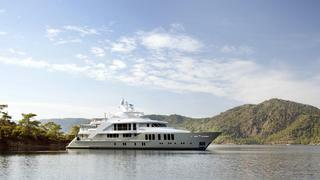 Managed for charter by Northrop & Johnson, Solo has a weekly summer charter rate starting from €595,000. Highlights: Designed by Francesco Paszkowski and Margherita Casprini, the recently delivered Solo is one of the swankiest superyachts cruising the Med this summer. Among her highlights, there's a glass fronted infinity pool that sits on the main deck, a Jacuzzi with a swim up bar, and a helipad that doubles as a dancefloor. For those in need of some R&R, Solo’s beach club has a sauna, hammam and massage room, and for those who enjoy a faster pace, she is stocked with watersport equipment including scuba gear, Jetskis, Jetsurfs, trampolines, kayaks and a sea pool. 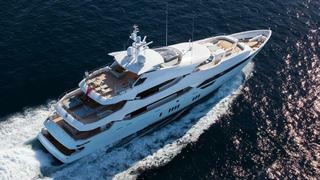 Managed for charter by Northrop & Johnson, Solo has a weekly summer charter rate starting from €595,000. Stats: 68.5 metre, Amels, 2006, 12 guests, 19 crew Highlights: In true Mediterranean style, Lady E offers plenty of spots for al fresco dining across her five magnificent decks so you can make the most of the sunny weather. Spend afternoons lounging on the sun pads that surround a four metre sun deck spa pool or indulge in the spa complete with a sauna, hammam and massage room (there’s an on board beauty therapist who’s a qualified masseuse and yoga instructor). For thrill-seekers, Lady E is jam-packed with water toys, including Jetskis, see-through kayaks, sea bobs, Laser Pico dinghies, flyboards, hoverboards, a sea-trampoline, and an enormous inflatable slide – just to name a few. 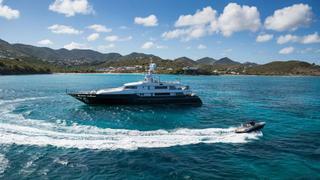 Lady E is managed for charter by Burgess with a weekly rate starting at €476,000. Highlights: In true Mediterranean style, Lady E offers plenty of spots for al fresco dining across her five magnificent decks so you can make the most of the sunny weather. Spend afternoons lounging on the sun pads that surround a four metre sun deck spa pool or indulge in the spa complete with a sauna, hammam and massage room (there’s an on board beauty therapist who’s a qualified masseuse and yoga instructor). For thrill-seekers, Lady E is jam-packed with water toys, including Jetskis, see-through kayaks, sea bobs, Laser Pico dinghies, flyboards, hoverboards, a sea-trampoline, and an enormous inflatable slide – just to name a few. Lady E is managed for charter by Burgess with a weekly rate starting at €476,000. Stats: 41.1 metres, Mondomarine, 2009, 10 guests, 7 crew Highlights: New to the charter market, Legenda will be spending this summer cruising the East Mediterranean. On board, there are numerous spots to enjoy al fresco meals, including the sun deck where guests can enjoy sunny lunches with sea views, dip in and out of the Jacuzzi and sip cocktails at the bar. Inside, she boasts two large saloons, one which doubles as a cinema room with a library, as well as a full-beam master suite on the main deck with two full-beam doubles below. Plus, all cabins have en suite bathrooms and heated marble floors. 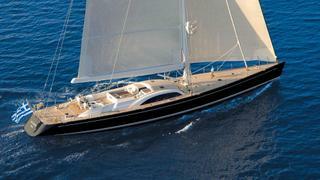 Legenda is managed for charter with Imperial, and has a weekly rate starting at €135,000. Highlights: New to the charter market, Legenda will be spending this summer cruising the East Mediterranean. On board, there are numerous spots to enjoy al fresco meals, including the sun deck where guests can enjoy sunny lunches with sea views, dip in and out of the Jacuzzi and sip cocktails at the bar. Inside, she boasts two large saloons, one which doubles as a cinema room with a library, as well as a full-beam master suite on the main deck with two full-beam doubles below. Plus, all cabins have en suite bathrooms and heated marble floors. 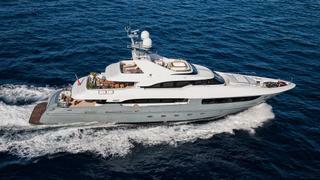 Legenda is managed for charter with Imperial, and has a weekly rate starting at €135,000. Stats: 61.7 metres, CMB Yachts, 2010, 12 guests, 16 crew Highlights: The cheerful blue hue of Mary-Jean II makes this superyacht instantly recognisable. On board, her colourful hull is accented in the soft furnishings of her multiple al fresco lounge and dining areas on the upper decks, while blonde-toned woods and wickers brighten up her art-filled interiors. Her sun deck is fitted with a Jacuzzi, sunpads and an outdoor cinema while her beach club carries diving equipment, clear-bottomed kayaks, Jetskis and Seabobs. Below deck, Mary-Jean II offers spacious staterooms and lounge areas, a formal dining room, a cinema area with a giant flatscreen and a fully-equipped gym. Mary-Jean II is managed for charter by YPI and has a weekly summer charter rate starting from €310,000. Highlights: The cheerful blue hue of Mary-Jean II makes this superyacht instantly recognisable. On board, her colourful hull is accented in the soft furnishings of her multiple al fresco lounge and dining areas on the upper decks, while blonde-toned woods and wickers brighten up her art-filled interiors. Her sun deck is fitted with a Jacuzzi, sunpads and an outdoor cinema while her beach club carries diving equipment, clear-bottomed kayaks, Jetskis and Seabobs. Below deck, Mary-Jean II offers spacious staterooms and lounge areas, a formal dining room, a cinema area with a giant flatscreen and a fully-equipped gym. Mary-Jean II is managed for charter by YPI and has a weekly summer charter rate starting from €310,000. Stats: 47.3 metres, Sunseeker, 2014, 10 guests, 10 crew Highlights: With her numerous lounge and dining areas, Arados is a spacious yacht ideal for entertaining. She features plush, grey-tone soft furnishings, and panoramic windows flood her interiors with light. Ipad-controlled Bose sound systems are installed throughout for creating the ultimate party ambience. Above deck, there is an al fresco bar and dining area and a generous jacuzzi surrounded by large sun pads. Arados’s beach club includes a certified Jet Ski training centre and is stocked with paddle boards, fishing gear, waterskis/wakeboards, Seadoos and a range of inflatable towables, plus mountain bikes for onshore exploration. Arados is managed for charter by Camper & Nicholsons International, and her weekly summer charter rate starts from €200,000. Highlights: With her numerous lounge and dining areas, Arados is a spacious yacht ideal for entertaining. She features plush, grey-tone soft furnishings, and panoramic windows flood her interiors with light. Ipad-controlled Bose sound systems are installed throughout for creating the ultimate party ambience. Above deck, there is an al fresco bar and dining area and a generous jacuzzi surrounded by large sun pads. Arados’s beach club includes a certified Jet Ski training centre and is stocked with paddle boards, fishing gear, waterskis/wakeboards, Seadoos and a range of inflatable towables, plus mountain bikes for onshore exploration. Arados is managed for charter by Camper & Nicholsons International, and her weekly summer charter rate starts from €200,000. Stats: 47 metres, CMB Yachts, 2012, 10 guests, 9 crew Highlights: With an outdoor bar, lounge, Jacuzzi and enormous sunpads, Orient Star's sun deck is the ultimate hub for entertaining and lounging on board. For guests who like to keep active, Orient Star offers hours of on the water entertainment with an abundance of water toys including Jet Skis, a paddleboard and diving gear. Inside, she is designed with sleek, monochromatic interiors, exquisite marbled bathrooms and contemporary furniture. Her upper saloon is an exceptional space for unwinding in the evening, with floor-to-ceiling sliding windows on either side of the room that open up to reveal French-style balconies. Orient Star is managed for charter by Camper & Nicholsons and has a weekly summer charter rate starting from €145,000. Highlights: With an outdoor bar, lounge, Jacuzzi and enormous sunpads, Orient Star's sun deck is the ultimate hub for entertaining and lounging on board. For guests who like to keep active, Orient Star offers hours of on the water entertainment with an abundance of water toys including Jet Skis, a paddleboard and diving gear. Inside, she is designed with sleek, monochromatic interiors, exquisite marbled bathrooms and contemporary furniture. Her upper saloon is an exceptional space for unwinding in the evening, with floor-to-ceiling sliding windows on either side of the room that open up to reveal French-style balconies. Orient Star is managed for charter by Camper & Nicholsons and has a weekly summer charter rate starting from €145,000. Stats: 49.9 metres, Codecasa, 2003, 12 guests, 11 crew Highlights: Designed by and built for fashion designer Giorgio Armani, Mariu is chic both inside and out. 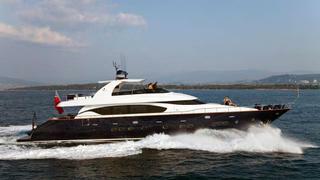 The yacht is well set up for charters of families and friends, with open plan saloons and six minimalist double cabins. Morning coffees are best enjoyed on the foredeck or up on the sundeck where there’s plenty of loungers and sunpads which can be shaded thanks to new automatic awnings (which come in handy for al fresco afternoon naps). She also boasts an impressive selection of water toys including Jet Skis, Seabobs, kiteboards, windsurfing equipment and towables galore. Mariu is managed for charter by Edmiston, and has a weekly rate starting at €185,000. Highlights: Designed by and built for fashion designer Giorgio Armani, Mariu is chic both inside and out. 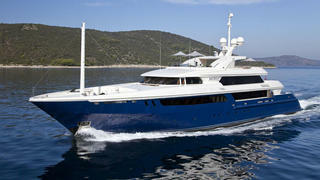 The yacht is well set up for charters of families and friends, with open plan saloons and six minimalist double cabins. Morning coffees are best enjoyed on the foredeck or up on the sundeck where there’s plenty of loungers and sunpads which can be shaded thanks to new automatic awnings (which come in handy for al fresco afternoon naps). She also boasts an impressive selection of water toys including Jet Skis, Seabobs, kiteboards, windsurfing equipment and towables galore. Mariu is managed for charter by Edmiston, and has a weekly rate starting at €185,000. Stats: 54 metres, Neta Marine, 2018, 12 guests, 10 crew Highlights: Delivered just last year, this luxury motorsailer will be setting sail in her home waters in Turkey this summer. Perfectly designed for warm Mediterranean climes, guests will find a number of sunbathing spots throughout. On the main deck there are enormous sunpads aft, while the sundeck boasts numerous sunloungers, more sunpads and a Jacuzzi with a swim-up bar. Meanwhile, Meira's beach club carries a sauna and massage room, as well as a number of paddleboards, towables and a giant inflatable slide which can speed guests from the top deck to the sea. 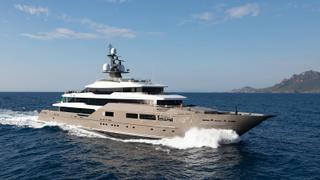 Plus, she's just been nominated for a World Superyacht Award. Managed for charter by Ocean Independence, Meira has a weekly summer charter rate starting from €105,000. Highlights: Delivered just last year, this luxury motorsailer will be setting sail in her home waters in Turkey this summer. Perfectly designed for warm Mediterranean climes, guests will find a number of sunbathing spots throughout. On the main deck there are enormous sunpads aft, while the sundeck boasts numerous sunloungers, more sunpads and a Jacuzzi with a swim-up bar. Meanwhile, Meira's beach club carries a sauna and massage room, as well as a number of paddleboards, towables and a giant inflatable slide which can speed guests from the top deck to the sea. 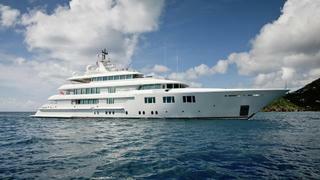 Plus, she's just been nominated for a World Superyacht Award. Managed for charter by Ocean Independence, Meira has a weekly summer charter rate starting from €105,000. Stats: 39.93 metres, Nautor’s Swan, 2006, 8 guests, 6 crew Highlights: Refitted in 2015, Aristarchos is an agile sailing yacht, capable of reaching top speeds of 15 knots, and is perfect for a week of island hopping in the Med. Her sundeck features a generous al fresco dining and lounge area, and her beach club carries snorkelling and fishing gear, plus paddleboards, waterskis and an inflatable speedboat and Jet Ski. Inside, there's a cosy saloon with a library, and the caramel tones of her wooden interiors are complemented by elegant leather furniture. The largest yacht ever delivered by builder Nautor Swan, Aristarchos is ideal for hosting smaller groups or families on an exhilarating cruise around the East Mediterranean. Managed for charter by IYC, Aristarchos has a weekly summer charter rate starting from €75,000. Highlights: Refitted in 2015, Aristarchos is an agile sailing yacht, capable of reaching top speeds of 15 knots, and is perfect for a week of island hopping in the Med. Her sundeck features a generous al fresco dining and lounge area, and her beach club carries snorkelling and fishing gear, plus paddleboards, waterskis and an inflatable speedboat and Jet Ski. Inside, there's a cosy saloon with a library, and the caramel tones of her wooden interiors are complemented by elegant leather furniture. The largest yacht ever delivered by builder Nautor Swan, Aristarchos is ideal for hosting smaller groups or families on an exhilarating cruise around the East Mediterranean. 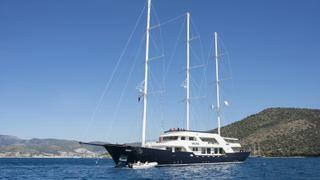 Managed for charter by IYC, Aristarchos has a weekly summer charter rate starting from €75,000. Stats: 38.4 metres, Gulf Craft, 2012, 11 guests, 7 crew Highlights: Despite her smaller length, Marina Wonder boasts an intelligent use of space; her upper deck features a number of al fresco dining and lounge options, a dedicated sunbathing area with padded deck chairs, and a Jacuzzi. Below deck, Marina Wonder reflects classic interior design schemes with warm wood finishes throughout her saloon and staterooms. Interior highlights on board include a bar, the elegant spiral staircase, a circular dining table and private office. For time spent in the water, Marina Wonder carries snorkelling gear, paddleboards and a number of inflatable boats. Marina Wonder is managed for charter by Yachtzoo and her weekly summer charter rate starts from €110,000. Highlights: Despite her smaller length, Marina Wonder boasts an intelligent use of space; her upper deck features a number of al fresco dining and lounge options, a dedicated sunbathing area with padded deck chairs, and a Jacuzzi. Below deck, Marina Wonder reflects classic interior design schemes with warm wood finishes throughout her saloon and staterooms. Interior highlights on board include a bar, the elegant spiral staircase, a circular dining table and private office. For time spent in the water, Marina Wonder carries snorkelling gear, paddleboards and a number of inflatable boats. Marina Wonder is managed for charter by Yachtzoo and her weekly summer charter rate starts from €110,000. Stats: 28 metres, Maiora, 2006, 9 guests, 4 crew Highlights: Asha is made for sun worshippers. The large flybridge offers an excellent area for al fresco entertainment featuring sun pads, a Jacuzzi, a wet bar and fridge, a dining table and a Bimini top providing shade. Meanwhile, a large foredeck sunpad is the perfect place to kick back and catch some rays. Her collection of water toys include kayaks and paddleboards, a number of towables and a 10-person inflatable flamingo. Asha is managed for charter by Worth Avenue Yachts, and has a weekly rate starting at $45,000. Highlights: Asha is made for sun worshippers. The large flybridge offers an excellent area for al fresco entertainment featuring sun pads, a Jacuzzi, a wet bar and fridge, a dining table and a Bimini top providing shade. Meanwhile, a large foredeck sunpad is the perfect place to kick back and catch some rays. Her collection of water toys include kayaks and paddleboards, a number of towables and a 10-person inflatable flamingo. 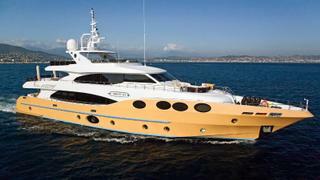 Asha is managed for charter by Worth Avenue Yachts, and has a weekly rate starting at $45,000.